An MP has tens of thousands of constituents, and many political issues competing for their attention. How can we make them pause to look at the bigger picture and recognise that climate change should be high on their priorities? There are different ways of raising the issue. One is a mass email campaign or petition. On a national issue, these have to get to a significant size to have much of an impact. But on related local issues, a much smaller petition can be effective. Personal letters or emails are good - see below for a template. Note that a lot of the advice on this page can apply to other decision-makers you might want to influence, such as local councillors. There is an easy way to do that right now, by joining with others in the Speak Up Week of Action. Diversity can be a good way of breaking through some of the stereotypes that your MP might hold - if your group has younger and older members, people whose line of work is affected by government policies on climate, people who are coming from a faith perspective, etc. it is harder for this to be seen as a 'niche' interest! It's important to understand their perspective: if you can approach from an angle they are already sympathetic with, there is a much higher chance of getting your message across. You can find out what they have been saying in Parliament at www.theyworkforyou.com, Google for media appearances, and some MPs' Twitter accounts are also very informative. MPs may be more willing to talk about locally relevant issues, both because they may feel that they have more direct influence and also if they feel they can gain popularity with constituents by taking a stand. Do you want to arrange a visit to their office or invite them to attend an event? While the former is more simple to arrange, the latter can have the advantage of allowing you to set the stage. Is there a local project that you would like to show off, a thriving green business, or a school which has installed solar panels? An event with a more 'social' feel, such as a tea-party, can give a relaxed feel and help disarm the MP. If the MP gets something in return for their time such as a photo appearance in the local paper, that can help build a positive relationship. Finding out about their interests may help spark some ideas. What are the key messages to get across? There is one overriding one: that urgent action is needed on climate change, that the policies in place are not sufficient, and that the government needs a clear plan of action in line with the Paris agreement on climate change. But because there are so many different areas in which action is needed to achieve what we need to overall, there are choices to be made about what other areas to highlight. The particular interests and concerns of those in the group will influence this, but you should also take a step back and think strategically: are there areas of discussion which will make your MP more inclined to listen to you - for example growing the green economy or (especially for Labour MPs) the union-supported campaign for a million climate jobs? Or areas where they might be able to be influential? It's good to be well-prepared. If you have lots of information at your fingertips, then only a tiny proportion will actually be used in the meeting (it's supposed to be a discussion, not a lecture!). And you are there as a constituent, not an expert. But persuasive statistics can be vital both in making a case and keeping a conversation going. For example, if your MP says that the government has been doing brilliantly on renewables, because lots of solar energy has been installed, you can agree that there has been a lot of progress since the price of solar energy has dropped dramatically, but you're concerned that this is now grinding to a halt: since the government cut subsidies dramatically, 12,000 jobs were lost in 2015, a third of the total, and installations in the first quarter of this year to have fallen by 75 percent of the previous level. A useful reference might be the overview we put together of the government's first year in office and the cutbacks to climate action. Or if your MP feels that renewables can never be more than a tiny proportion of the UK's energy supply, you could point to all the other European countries who are somehow managing to achieve much more than we are (useful comparison here). The Climate Coalition's conversation starter also has some useful positive facts about the potential of renewable energy (you may need to reduce the size of this document to read it). When preparing, it's important to think about the counter-arguments which are likely to come up, and responses to these. Who is going to ask what question? What are your individual strengths? For example one person might be an 'expert', another good at staying calm under pressure, another be someone the MP might not see as a 'usual suspect'. Listen first. Don't leap in with the most controversial issue, try and find some common ground and build on that. Can you frame it so the MP can be your ally? Then try and make your arguments using their language and values. Acknowledge concerns they raise (e.g. about the cost of renewables) rather than dismissing them out of hand. Then you can present alternative viewpoints. Climate change is a life-and-death issue and an urgent one. It can be incredibly frustrating when people don't 'get it'. But to persuade you need to be persuasive, hectoring or getting angry will simply turn people away from what you are trying to get across to them. Your passion when talking climate change important, but one must not be so passionate that the message is lost. Make the MP feel that they would not be going out on a limb by doing the action you are asking for or supporting your campaign. We like to know that people like us already agree with an argument - give them examples. 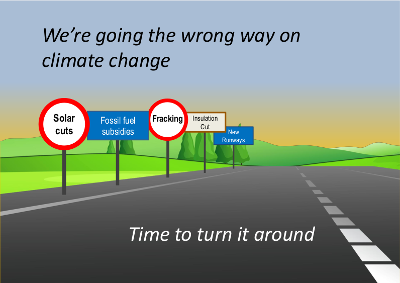 Conservative MPs may acknowledge the need for climate action but argue that we are doing enough already. But as well as the references above on us falling back on climate action and the potential to do much more, it's important to note that the independent Committee on Climate Change (chaired by a Conservative peer, Lord Deben) found that on current policies the UK would only get half way towards the emissions cuts needed under the Climate Act by 2030. Read up on Labour's policies on energy and climate change in their manifesto. Opposition MPs also need to be holding the government to account right now, both in general terms - calling for a plan to transform the economy and invest in clean energy so we can meet our commitments under the Climate Act, and challenging specific policies. For example the Labour Party supports a ban on fracking. But is your MP on board with other issues such as the need to limit aviation expansion and scrap plans for a new London runway? Write a thank you letter. Send photos to local journalists and the MP. I can't meet my MP on this occasion, but I'd like to write to them. A small pile of personal messages will have more impact than an inbox full of click and send template emails. The latter's fine, especially if campaigns get really big numbers of responses, but if you can, it's worth putting effort into the former. If your MP is not sympathetic, will one letter change their mind? It's very unlikely. But we do know that for many MPs, it does not appear to them that climate justice is an important issue to their constituents. Why are so many backbench Conservatives so against wind turbines that they have managed to block future support for the cheapest form of clean energy? Arguably because the minority of their constituents who dislike this technology are extremely vocal. We need to be vocal too! So it's worth following up on previous contacts, sending a personal letter referencing this. Remember to be polite. Facts are important but so is the personal touch. Remember, if you don't agree with your MP's political stance more generally, this is not the place to air your views! People are generally more convinced by arguments that chime with their values - you might find this report on convincing the centre-right to act on climate change of interest. But your letter doesn't have to be perfect. What's important is that it lands in your MP's inbox or in-tray as a genuine message from you, their constituent, (hopefully alongside many others!) and is the start of a conversation. I am writing to you because of my concern that the UK is going in the wrong direction on climate change. Say what has moved you to write - this might be a general concern for your children or grandchildren's future, recent news about the impacts of climate change (from the Arctic to the Great Barrier Reef, to new global temperature records there are unfortunately no shortage of these), or one particular policy issue you are concerned about. Explain why you think the UK's current action on climate change is insufficient (the Committee on Climate Change report may be useful as well as our own briefing here, and another summary here). And include something positive, for example the falling cost of renewable energy, the potential for climate jobs to regenerate your local area! (call for action) forward my letter to Greg Clark, the Secretary of State for Business, Energy and Industrial Strategy / raise these issues in Parliament / meet me and others to discuss our concerns / (for a Labour MP) challenge the government more strongly and support positive solutions such as the Campaign against Climate Change's One Million Climate Jobs campaign. Could you get others to join you in writing letters? Here's a guide to running a letter-writing session (focused particularly on churches but applicable to many other settings). Or how about holding a stall on your high street or at a local fair where people can fill in and customise postcards to their MP?